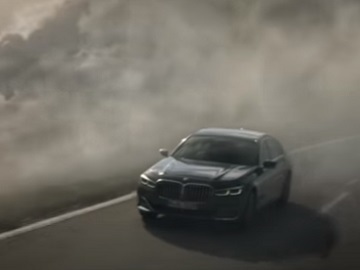 BMW has released a first official TV commercial for its BMW 7 Series. Titled “Above the Clouds,” the spot conveys metaphorically “how important it is to not let yourself be stopped by inner and outer obstacles, but to courageously and confidently find a new path that is your own” and features the pilot of a private plane who, informed that a bad weather front prevents him from taking off, decides to drive his BMW 7 instead. He accelerates the car and speeds down a dark and rainy runway strip higher and higher, until he breaks through a blanket of clouds on a pass road. “For those who will always find a way. A way to rise above and live what they love, the new 7,” the voiceover says, while the driver is seen experiencing a moment of serenity as he is up there, above the clouds and the storm, at the wheel of the BMW 7. According to the automaker, the new BMW 7 Series “stands for an extraordinary presence, maximum performance and unique comfort”. Newly designed super-slender headlight units, a significantly enlarged BMW kidney grille, a newly designed apron, narrow reflectors and trapezoidal tailpipe trims in the rear, extended stitching and high-quality interior trim strips that offer a luxurious ambience are only some of the features of the new BMW 7 Series Sedan, which also boasts the BMW Personal CoPilot – a suite of numerous driver assistance systems and automated functions that help the driver in various situations.